The western is such an unfashionable genre that any sign of life is welcome. Scott Cooper's brooding, slow-burning frontier saga has echoes of Dances with Wolves and the John Ford classic The Searchers as it invests the familiar with the guilty conscience hindsight of a 21st century sensibility. 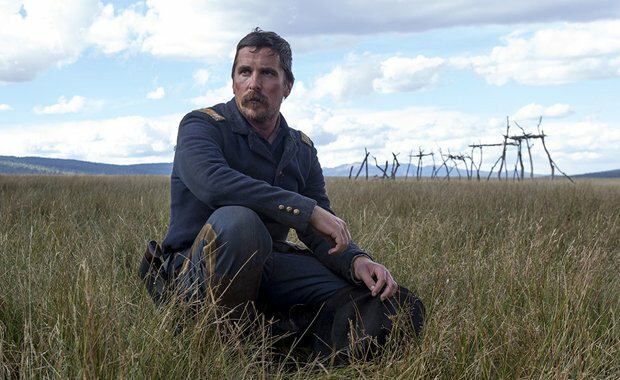 Christian Bale is very much in the Ethan Edwards tradition as gruff cavalry captain Joseph Blocker, a loyal servant of the state who has spent his career following orders and eradicating the Native American population. It is 1892 and times are changing, so even Blocker might be forced to confront his actions. He is the one ordered to accompany his old adversary Chief Yellow Hawk (Wes Studi) and his family to their tribal lands in Montana. Yellow Hawk is terminally ill and his last request has become a presidential order that the reluctant Blocker must obey. Unfolding as a long journey from Fort Berringer in New Mexico to the Valley of the Bears in Montana, Hostiles is filled by with beautiful landscapes and countless chances for sworn enemies to finally acknowledge the humanity in each other. Fragile widow Rosalie (Rosamund Pike) joins the party along the way and also comes to admire Yellow Hawk and his family. Despite notable work from Studi as the dying man and Adam Beach as his son Black Hawk, it is a source of disappointment that the film never devotes the time and care into making the Native Americans more substantial. You are left feeling they primarily exist to engineer the redemption of the white characters. Nevertheless, this is a sincere, thought-provoking drama that rewards the patient viewer and features an understated Bale as a man finally coming to terms with a past steeped in hatred and slaughter. General release from Fri 5 Jan.